The ability to quantitatively measure the expression of all genes in a given tissue or cell with a single assay is an exciting promise of gene-expression profiling technology. An in situ-synthesized 60-mer oligonucleotide microarray designed to detect transcripts from all mouse genes was validated, as well as a set of exogenous RNA controls derived from the yeast genome (made freely available without restriction), which allow quantitative estimation of absolute endogenous transcript abundance. One of the most tantalizing promises of gene-expression profiling technology has been to develop assays that measure expression of all genes in a given species . This is especially important for the mouse, which is a standard model for various human diseases. The early and rapid development of murine bioinformatics resources such as the draft genome assembly  and numerous expressed sequence tag (EST) projects have bolstered the feasibility of developing such microarray platforms for the mouse. However, because it has been difficult to identify all murine genes and correctly group genomic and expressed sequences into genes and transcripts, microarray platforms intended to cover all mouse genes are only now being made widely available, long after the draft assembly was released. Relatively recent microarray technologies, which require sequence information instead of clones as input, allow investigators to design microarray platforms to detect genes without having to obtain clones, including genes which have yet to be cloned or confirmed as an expressed transcript . Platforms that utilize long oligonucleotides give high sensitivity, with the potential for transcript specificity sufficient to distinguish transcripts from the same locus or closely related gene-family members [4, 5]. While microarray-based methods can provide very accurate relative (ratio-based) expression measurements, they usually do not provide absolute expression measurements (that is, transcript copy number). One notable exception described in the literature does provide absolute expression measurements in yeast, but not as copy numbers . That method relies on labeled oligonucleotides complementary to common sequence in each cDNA probe, which are hybridized against each slide as the reference target. In the case of long-oligonucleotide-based microarrays, there is no sequence common to all probes, so such a strategy is not feasible. An appropriate approach for such microarray platforms is to monitor the hybridization behavior of a few spiked-in RNA controls with sequence derived from yeast or other genomes. Control transcript probe intensity data can be used to create a generalized dose-signal model and applied to endogenous transcript intensity data to give transcript abundance estimates. Not only would such absolute expression measurements from microarrays help determine what level of sensitivity is required for downstream validation methods, but they would also allow direct comparison of expression data generated using different methods, as well as a valuable mechanism to compare performance between slides, platforms, or experiments . Most importantly, global absolute expression measurements can be used to more fully describe a given transcriptome, perhaps identifying mRNAs present at less than one copy per cell as candidates for heterogeneous or cell-type-specific expression, or subdividing groups of genes in Gene Ontology (GO) nodes  based on transcript abundance. The work described here is focused on two goals, aimed at facilitating standardization and comparison among mouse microarray studies: first, to create a long-oligonucleotide-based microarray platform covering all identified mouse genes, which can be made widely available; and second, to develop exogenous RNA controls which will allow quantitative estimation of absolute endogenous transcript abundance. The microarray will be made available to the community through Agilent Technologies and exogenous control plasmid vectors will be available upon request from the authors and the American Type Culture Collection (ATCC) (ATCC MBA-201 to -207) without restriction, to be used with the design presented here or incorporated into any non-yeast microarray platform. The development of a mouse whole-genome microarray in our laboratory has been an ongoing effort, and each new design has been derived in part from its predecessor (see Additional data files 1 and 2 and Materials and methods for details) . Development of the National Institute on Aging (NIA) Mouse Gene Index  facilitated more complete, less redundant microarray design than EST clustering alone for the following reasons. First, clustering was mapped to the genome assembly, improving consolidation of transcriptional units. Second, transcript selection is no longer restricted to library contents, allowing genes absent from NIA cDNA clone collections  to be included from other public sequence collections. Finally, all potential splice variants were solved from EST alignments with genomic sequence, so that probes can be designed to common regions in a transcript family, minimizing the effect of differential splicing. Therefore the index has been the basis of gene/transcript identification and sequence selection for all oligonucleotide array designs subsequent to the NIA Mouse 22K Microarray v1.1. During the preparation of this paper, assembly of a long-oligonucleotide microarray platform with full coverage of the mouse genome was reported by Zhang et al. using a sequence selection protocol that incorporated all National Center for Biotechnology Information (NCBI) RefSeq entries, including all mRNA transcripts based solely on prediction algorithms, without experimental evidence of expression (XM sequences). In contrast, our protocol included only a minority of the XM sequences (only those annotated as an identified gene). As our oligonucleotide probe design and selection process differed slightly from protocols previously used with ink-jet microarrays, we first established that our oligonucleotide probes perform as well as or better than those designed with standard protocols [5, 9, 13]. To assess the overall performance of the oligonucleotide probes, we carried out a mixing experiment, combining total RNA from E12.5 mouse embryos and placentas to produce a range of gene-expression ratios for each transcript, using a preliminary microarray design (NIA Mouse 22K Microarray v2.0, see Additional data files 1 and 2 for details). In a comparison of E12.5 mouse embryo and placental RNA, statistically significant differential expression was detected for 8,461 of the test array's 21,044 oligonucleotide probes. These differential targets were then examined in the mixtures to calculate observed placental RNA fractions. 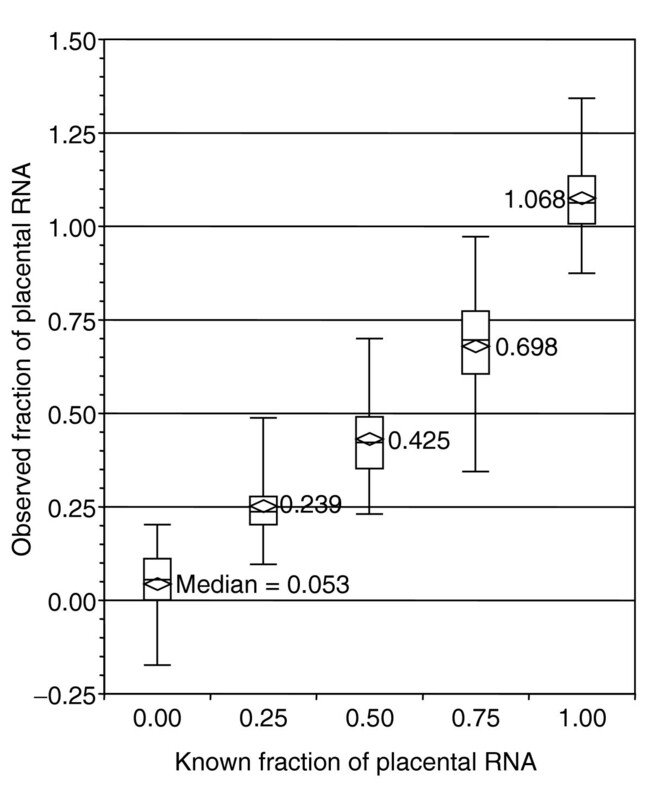 Figure 1 shows that the distributions of the observed placental RNA fractions at each input level were closely matched with the input placental RNA fractions (median observed fraction = input fraction ± 0.075), and the boundaries of 95% confidence regions were 0.121 to 0.405 from the median. These distributions were consistent with, although narrower than, those seen in a similar study  using standard oligonucleotide design procedures, suggesting that our design protocol produces comparable results. More importantly, these data suggest that the oligonucleotide probes are capable of highly quantitative, proportional measurements of transcript abundance, a property required for transcript abundance estimation. 60-mer oligonucleotide probe linearity testing. To test the performance of 21,044 60-mer oligonucleotide probes, E12.5 embryo RNA and placenta RNA were combined to form five pairs of duplicate samples containing from 0 to 100% placental RNA. Box-plot distribution data for each placental RNA input level is shown above, with median values labeled. The boxes show the 25-75 percentile range, with the mean and median indicated by the central straight line and diamond, respectively. Upper and lower bars show the 2.5 to 97.5 percentile range. Observed fraction medians are within 0.075 of input values, and 95% of values are within 0.405 of input values. Exogenous RNA control transcripts were developed from Saccharomyces cerevisiae intronic and intergenic sequences [14, 15]. A total of 11 candidate sequences were cloned and tested against multiple oligonucleotide probes in preliminary microarray hybridizations (data not shown). After assessing which target/probe pairs produced the best dynamic responses to abundance with the lowest noise, seven control transcripts and corresponding oligonucleotide probes (Tables 1 and 2) were selected for use in the control set. As a result, the NIA Mouse 44K Microarray v2.0 contains all 63 oligonucleotide probes considered as controls, while version 2.1, the final version which will be made available to the community, contains only the seven selected for use, spotted ten times each at different locations on the slide. Loading of each control transcript into total RNA was confirmed as accurate within 2.6-fold by quantitative real-time RT-PCR (qPCR) (Figure 2a), with a very tight correlation (r2 ≥ 0.99) between expected and measured values over seven orders of magnitude. Relating yeast spike-in RNA control copy number to qPCR measurements and microarray signal intensity. (a) To verify abundances of yeast sequence RNA transcripts in a control mixture, cDNA was transcribed from the control mixture alone (open boxes), as well as E12.5 whole-mouse embryo total RNA (open diamonds) and Universal Mouse RNA (filled triangles) with added spike-in control mixture. The cDNA was used as template for real-time PCR quantitation of each yeast sequence RNA, using a separately prepared standard of cDNA transcribed from the yeast sequences. Expected and measured copy numbers are closely matched (r2 ≥ 0.99), with maximum measured/observed ratios of 1.5, 1.5, and 2.6, respectively. (b) Expression profiles were generated for triplicate total RNA samples from E12.5 embryo (filled circles), E12.5 placenta (open circles), ES cells (filled boxes), and TS cells (open boxes) with yeast sequence control transcripts spiked-in prior to target labeling. For the seven control transcripts, mean log10[intensity] is shown for each tissue type, as well as the mean across all samples (filled triangles), and these data were used to perform linear regression analysis and relate signal intensity to transcript copy number, allowing abundance estimation for endogenous transcripts. The regression line for the average of all tissues (dashed line) and its equation is shown. Intensity-copy number correlations for individual tissues were very strong, with r2 values of 0.98 - 0.99. One basic assumption made in our experimental design is that amplification efficiencies are approximately equal between endogenous mouse transcripts and exogenous yeast control transcripts. To test this, transcript abundances were determined by qPCR for cDNA pools synthesized from total RNA with spike-in controls added, as well as labeled cRNA target mixtures amplified from the same total RNA/spike-in control mixtures, and transcript abundances were determined by qPCR. After linear amplification, individual ratios of each control transcript to the endogenous transcript Dnchc1 (Table 3) were within 3.5-fold (average = 1.98-fold) of those prior to amplification (Figure 3), and the slopes of regression lines for pre- and post-amplification datasets were 0.967 and 0.992, respectively. Results were consistent whether using amplification yield versus input or the increase in Dnchc1 transcripts as measured by qPCR to calculate the fold amplification and fraction of the original sample represented by each qPCR well. The stability of the relationship holds over seven orders of magnitude, suggesting that amplification of transcripts during cRNA microarray target synthesis is not a source of significant bias. In previous attempts using control transcripts with short (20-40 nucleotides) vector-derived poly(A) tails, exogenous controls amplified one or two orders of magnitude less efficiently than endogenous messages (data not shown), indicating that sufficient polyadenylation of controls is critical for efficient amplification. Exogenous control and endogenous transcript amplification rates are closely matched over seven orders of magnitude. Transcript abundance of each spike-in control transcript was measured by qPCR before and after linear amplification labeling, and compared to amounts of the exogenous transcript Dnchc1. After amplification, individual ratios of each control transcript to the endogenous transcript were within 3.5-fold (average = 1.98-fold) of those prior to amplification. Blue diamonds = log10[ratio mean control/Dnchc1 transcripts] of three E12.5 embryo and three E12.5 placenta samples before amplification. 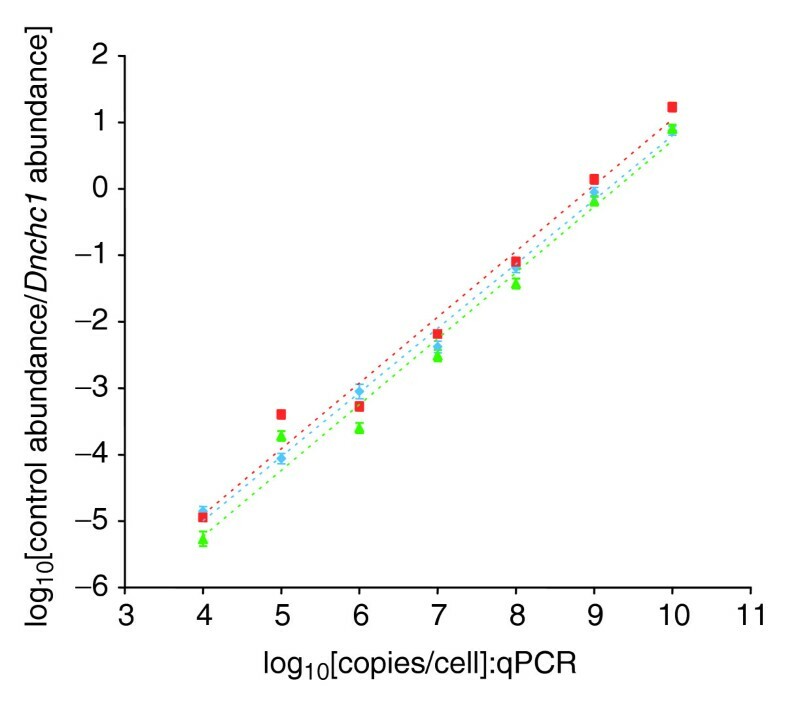 Red boxes, green triangles = log10[ratio mean control/Dnchc1 transcripts] for the same samples after amplification, using yield versus input (red boxes) or the increase in Dnchc1 transcripts as measured by qPCR (green triangles) to calculate the fraction of the original sample represented by each qPCR well. Microarray expression profiles were generated for three distinct samples each of total RNA from E12.5 whole embryos (EM), E12.5 placenta (PL), R1 embryonic stem cells (ES), and GFP-Exe trophoblast stem cells (TS) . For each microarray, linear regression analysis on mean normalized log10[intensity] values for seven yeast spike-in control probes was used to define a standard curve relating signal intensity to copy number (Figure 2b) for estimation of endogenous transcript abundances. Correlations were very strong between log10[intensity] and log10[input copy number], with r2 ≥ 0.95. To test the accuracy of estimating transcript abundance in this way, we compared the results with qPCR measurements for a panel of 13 endogenous transcripts (Figure 4). Most (36 of 52, or 69.2%) of the microarray-based transcript copy-number estimates for a panel of 13 endogenous genes were within fivefold of qPCR measurements. Furthermore, trending for each transcript across the four tissue types was consistent between the two methods for all ten non-housekeeping genes showing differential expression. Validation of transcript abundance estimation for endogenous transcripts. qPCR primer sets were designed for selected genes so that amplicons were upstream of 60-mer oligonucleotide probes when possible, or less than 650 bp downstream, and copy number was estimated using serial dilutions of RNA, in vitro transcribed from mouse cDNAs, at known copy numbers as standards. Error bars represent one standard deviation across three replicate samples for each tissue. Dotted diagonal lines represent five- and tenfold differences between the two datasets. Each gene's official symbol, along with the unique identifier for the 60-mer oligonucleotide probe it was measured with, are listed in the key. Data was normalized to Gapd expression for both methods. EM = E12.5 embryo, PL = E12.5 placenta, ES = embryonic stem cells, TS = trophoblast stem cells. Many factors are likely to affect the accuracy of transcript abundance estimates. Measurements at or near the microarray's detection limit, but still above that of qPCR assays (Figure 4, Lpl and Axl in TS, filled arrows), tend to overestimate transcript abundance, and these data suggest that the lower limit of microarray-based transcript abundance measurement is approximately 0.05 to 0.06 copies per cell in this experiment. Differential transcript splicing can also have an effect: note that for Ank, H19, Hand1, and Igf2bp3 (Figure 4, open arrows), only one tissue out of four shows greater than a tenfold discrepancy, whereas the other measurement pairs are more closely matched. Given the preceding discussion, we present this method as a way to estimate transcript abundances for groups of genes. Accuracy of the estimates for each gene/probe may be further improved in the future by studying the effects of various probe-selection parameters on measured fluorescence intensity. Using conservative estimates of the total RNA content recovered from mammalian cells (2.0-3.0 pg/cell in this case, see Materials and methods), transcript abundances were expressed on a copies-per-cell basis (Figure 5). The analysis revealed two striking properties of these transcript-abundance distributions. First, mRNA populations in mammalian tissues are highly complex, which is consistent with previous observations [17, 18]. Many transcripts were measured at less than one copy per cell in each tissue (EM = 40.1 ± 0.6%, PL = 46.9 ± 1.3%, ES = 48.2 ± 1.9%, TS = 47.4 ± 3.4%) (Figure 5). A log10[intensity] value of 2.5 was used as a lower cutoff, which corresponds to about one copy in 26 cells, so it appears that measured values from 0.038 to one copy per cell represent transcripts present at very low measurable copy numbers, rather than nonexpressed transcripts. Indeed, quantitative RT-PCR studies in yeast have shown that many genes, particularly transcription factors, are expressed at less than one copy per cell . Furthermore, our estimates of numbers of expressed genes/transcripts and mRNA message content per cell (519,688 to 851,087 mRNAs per cell, 8,357 to 12,739 transcripts, expressed from 8,101 to 11,360 genes, Table 4) compare well with previous estimates ranging from 200,000 to 600,000 mRNAs per cell [20, 21], consisting of 11,500 to 15,000 diverse mRNA species [18, 20], transcribed from as many or more genes up to 17,000 [18, 20, 22]. Second, a majority of transcripts expressed in one tissue or cell type are commonly expressed in other diverse cell and tissue types. The number of expressed genes in each tissue was estimated by counting the number of microarray features measuring absolute expression of at least one copy per cell, and converting this set of microarray probes to U-clusters (loci) and transcripts via the NIA Mouse Gene Index (Table 4). Examination of the overlap between each cell type's roster of expressed genes and transcripts reveals that the majority are expressed in common (Tables 4 and 5), as suggested by previous assessments of mRNA complexity [18, 20, 22]. For example, 93% of expressed placental transcripts are also expressed in embryo, and this group represents 72% of the expressed transcripts in embryo (Table 5). The same relationship holds true for pairings of cultured cells with embryo, with 95% of expressed transcripts in cultured cells also found in embryo, covering 69% of embryonic transcripts. Distribution of mouse transcript abundances in E12.5 embryo and placenta, and cultured ES and TS cells. Transcript abundances are expressed as log10[copies per cell], varying over six orders of magnitude. The distributions are highly similar, despite the significant differences between the four tissues (for example, monolayer culture versus tissue, placenta versus embryo), suggesting that such distributions are not heavily skewed according to tissue structure or function. The percentage of transcripts present at less than one copy per cell ranged from 40.1 to 48.2% in the four tissues. Bins were centered on indicated values, and the dotted lines indicate values corresponding to mean upper and lower signal intensity reliability limits of one copy per 26 cells to 2,188 copies per cell. For definitions of tissue type see Figure 4 legend. U-clusters and transcripts from the NIA mouse gene index were considered expressed if microarray features measured absolute expression estimated at one copy per cell or more. Copy-number estimates from expressed transcripts were summed to estimate the number of mRNA molecules per cell for each tissue, as well as the mean and median copy numbers. Microarray features corresponding to expressed genes and transcripts were mapped to the NIA Gene Index to calculate the number of U-clusters (loci) and transcripts expressed in each tissue. 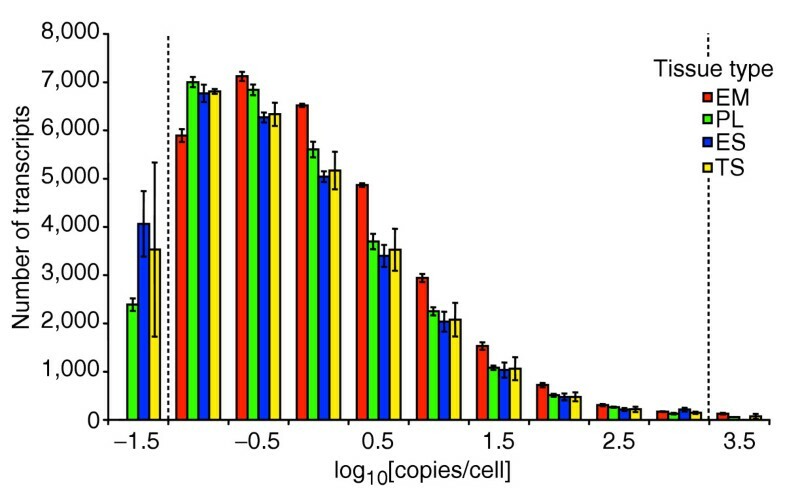 Sets of microarray features measuring expressed genes (≥ 1 copy per cell) were compared pairwise to calculate the number of members common to each pair. By matching microarray features to the NIA Gene Index, numbers of U-clusters (loci) and transcripts expressed in common were derived for each pairwise comparison. Signal intensities which were lower than those for all spike-in controls, as well as saturated signals, were not converted to copy number estimates (see Materials and methods), so these calculations may underestimate the number of expressed genes. When comparing frequency distributions for complex, in vivo samples and less complex in vitro cultured cells, we might expect to see large differences, particularly in the case of genes expressed at less than one copy per cell. Transcripts present at less than one copy per cell cannot be present in every cell, and therefore must be expressed heterogeneously. As might be expected, whole embryos had the most distinctive frequency distribution of the four samples examined: embryos had significantly fewer transcripts in the range log10[copies per cell] = -1.0 (0.1 copies per cell), but significantly more in the 0-2 (1 to 100 copies per cell) range. This difference, combined with the higher estimate of total transcripts per cell for whole embryos (Table 4), may reflect the activation, within the context of the very high transcriptional activity present in developing embryos, of many developmental pathways that are normally inactive or minimally active. In contrast, the high degree of similarity between the frequency distributions for placenta, ES, and TS cells (Figure 5) suggests that levels of expression heterogeneity can be similar for complex tissues and cultured cells. In fact, there is evidence in ES cells that gene expression within a culture is not as uniform as previously supposed, and even key differentiation markers such as Oct4 and cKit are expressed in cellular subpopulations within cultures . 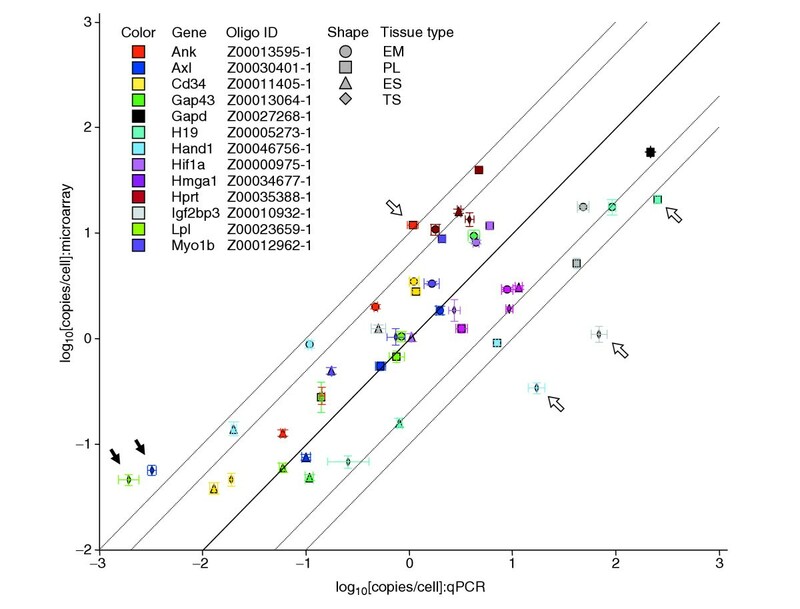 Taken together, these observations suggest that cultured ES and TS cells, although clonally isolated, are quite heterogeneous in terms of their gene-expression patterns, with a transcriptional complexity similar to that of E12.5 placenta. Further study, perhaps using in situ hybridization or single-cell RT-PCR methods, will be required to address this issue, but it does beg the question of whether or not this heterogeneity is common to all cultured cells, or a feature specific to pluripotent stem cells. Here we present an oligonucleotide microarray for gene-expression profiling with representation of the entire mouse genome, according to the NIA Mouse Gene Index version 2.0 . An integral feature of this new whole-genome microarray design is a set of probes detecting yeast spike-in control transcripts, which will be available to the community without restriction. Using qPCR, we have shown that this control system allows the reproducible estimation of absolute transcript levels. A valuable tool for the mammalian functional genomics community, this system is a step towards standardization of microarray results by using exogenous RNA control systems that are compatible with multiple microarray platforms and model organisms. The NIA Mouse 44K Microarray v2.0 (Whole Genome 60-mer Oligo) design was based on the NIA Mouse Gene Index v2.0 . Like the first version of the NIA Mouse Gene Index , it combines data from multiple transcript databases (RefSeq, Ensembl, Riken, GenBank, and NIA) to construct gene/transcript models which represent all possible transcripts. Briefly, 249,200 ESTs developed at NIA were clustered using clustering tools from The Institute for Genome Reserach (TIGR) , generating 58,713 consensus and singleton sequences which were then combined with the other datasets. The major difference in version 2 from version 1 is the use of a clustering method based on genome alignments rather than sequence homology between NIA EST clusters and public sequences. Individual sequences were aligned to the mouse genome  using BLAT , then clustered by an algorithm similar to the one described by Eyras et al. , to be published elsewhere. Our assembly included 30,796 primary genes and 1,318 gene copies or pseudogenes, as well as 28,928 clusters that did not match our criteria for high-confidence genes (open reading frame (ORF) of more than 100 amino acids or multiple exons). There were 65,477 transcripts associated with primary genes. Because transcripts were built from sequence alignments to the mouse genome, they match published genomic sequences  (February 2003 edition) exactly. In designing a mouse whole-genome microarray, we began by examining existing designs - the NIA Mouse 22K Microarray v1.1 (Development 60-mer Oligo) , which became commercially available from Agilent as the Agilent Mouse (Development) Oligonucleotide Microarray (see Additional data files 1 and 2), and the National Institute of Environmental Health Sciences (NIEHS) Toxicogenomics Consortium mouse array (Agilent Mouse Microarray). Criteria for selecting previously designed probes included a good match to the target gene's major transcript with the longest ORF, minimum predicted cross-reactivity with other expressed sequences, and nonredundancy. Although a perfect match of all 60 base-pairs (bp) of the oligonucleotide was preferred, we also accepted up to two mismatches to the genome if the oligonucleotide matched perfectly to the RefSeq sequence, and oligonucleotide sequences that did not match 100% to the RefSeq entry were corrected. An oligonucleotide was considered cross-reactive if its last 43 bp (solution end) matched to a non-target gene with less than five mismatches. Deletion placement studies using in-situ synthesized 60-mer oligonucleotide probes suggest that the 17 bp at the support surface have a negligible effect on hybridization intensity ; thus only the external 43 bp were considered important. While the cross-reactivity criterion is easily satisfied for unique genes with low similarity to other genes, many gene families had high sequence similarity between member transcripts, and it was impossible to find regions with low predicted cross-reactivity. In this case we considered the whole gene family as a target; then the oligonucleotide was considered cross-reactive only if it matched to genes outside the family. Gene families were assembled using a 30% transcript length alignment as a threshold of similarity; alignments for each pair of transcripts were generated using BLAT . According to the nonredundancy criterion, we left only one oligonucleotide that matched to each gene or gene family, and when probes from both the NIA Mouse 22K v1.1 and NIEHS Toxicogenomics arrays matched well to the same gene, preference was given to the NIA oligonucleotide. After filtering with the above criteria, we obtained 6,563 probes from the NIA Mouse 22K Microarray v1.1 and 9,551 probes from the NIEHS Toxicogenomics array. Among these oligonucleotides, 3,327 did not match the target gene's major transcript with the longest ORF, so we generated an additional 3,327 probes for major transcripts of the same genes. Then we generated 22,850 probes for the best transcripts of primary genes in the gene index that were not represented in the NIA Mouse 22K Microarray v1.1 (Development 60-mer Oligo) and NIEHS Toxicogenomics arrays, for a total of 42,291 non-control oligonucleotide probes (see Additional data file 2). For each transcript we generated ten probes using ArrayOligoSelector , then selected the best oligonucleotide on the basis of minimum predicted cross-reactivity, proximity to the 3' end, and degree of matching to RefSeq or GenBank sequences. The latter criterion was important only in cases of mismatches between genomic sequence and RefSeq or GenBank. All microarray data described in this report were generated using the NIA Mouse 44K Microarray v2.1 (Whole Genome 60-mer Oligo) and NIA Mouse 22K Microarray v2.0 (Development 60-mer Oligo). We have slightly modified the probe content of the NIA Mouse 44K v2.0 array by including Agilent's standard QC probe set, removing candidate spike-in control probes which were not used, and including additional probes for known genes that have existing probes with poor performance or ambiguous targeting. The updated version (NIA Mouse 44K Microarray v2.1 (Whole Genome 60-mer Oligo) will be made available to the community (see Additional data file 1). Yeast (S. cerevisiae) sequences were selected from public repositories [14, 15] to produce exogenous RNA control transcripts, commonly referred to as 'spike-in' controls. Fourteen candidates (ten intergenic and four intronic) were selected on the basis of sequence length and the absence of restriction endonuclease cleavage sites important for our cloning strategy. Sequences with significant matches to transcripts in the NIA mouse Gene Index v2.0  were discarded, and ten of the 14 remaining candidates were successfully cloned from genomic DNA, with one sequence divided into two clones for a total of 11 potential controls. Yeast sequences were amplified with added 5' SalI and 3' XbaI sites from S. cerevisiae genomic DNA (ATCC 2601D) using Sigma RedTaq, and cloned directly into pCR4-TOPO (Invitrogen). TA-TOPO clones were verified by sequencing on an Applied Biosystems 3100 capillary DNA sequencer, and inserts were directionally subcloned into pSP64 Poly(A) (Promega Catalog number P1241) using the introduced SalI and XbaI sites. A total of 63 60-mer oligonucleotide 'sense-strand' probes were selected for the 14 candidate sequences using both ArrayOligoSelector software  and arbitrary manual selection. Oligonucleotide probes were compared to NIA Gene Index transcripts, and no significant matches were found. Control probes were spotted ten times each in various locations throughout the slides. Spike-in RNA was transcribed, polyadenylated, and purified using Ambion mMessage mMachine, poly(A) tailing, and MegaClear kits, then sized and quantitated by RNA 6000 Nano assay on an Agilent Bioanalyzer 2100. Spike-in RNAs were pooled to create tenfold concentration differences, from 104 to 1010 copies per microliter (Table 1). Before preparation of microarray targets, 1 μl of this control transcript mixture was added to 5-μg aliquots of each total RNA sample, including the reference RNA. A separate pool with all yeast control transcripts present at the same copy number was added to reference RNA and converted to cDNA for use as a standard in qPCR assays. Total RNA was prepared using TriZol reagent (Invitrogen) from E12.5 C57BL/6J embryos, pooled by litter, and corresponding E12.5 C57BL/6J placenta pools . Total RNA was also prepared from R1 ES cells passaged briefly on gelatin to remove feeder cells, and GFP-Exe TS cells grown on plastic in conditioned medium as previously described . Total RNA quantity and quality were assessed by RNA 6000 Nano assay. For oligonucleotide signal linearity testing, E12.5 embryo and placenta total RNA were pooled, based on this quantitation, to produce duplicate samples with 0, 25, 50, 75, and 100% placental RNA content. Fluorescently labeled microarray targets were prepared from 2.5 μg aliquots of total RNA samples with yeast sequence control mixtures added as described above, using a Low RNA Input Fluorescent Linear Amplification Kit (Agilent). A reference target (Cy5-CTP-labeled) was produced from Stratagene Universal Mouse Reference RNA, and all other targets were labeled with Cy3-CTP. Targets were purified using an RNeasy Mini Kit (Qiagen) as directed by Agilent's clean-up protocol, and quantitated on a NanoDrop scanning spectrophotometer (NanoDrop Technologies). All hybridizations compared one Cy3-CTP-labeled experimental target to the single Cy5-CTP-labeled reference target. Microarrays were hybridized and washed according to Agilent protocol G4140-90030 (Agilent 60-mer oligo microarray processing protocol - SSC Wash, v1.0). Slides were scanned on an Agilent DNA Microarray Scanner, using standard settings, including automatic PMT adjustment. Primer sets were designed and tested for SYBR Green chemistry using an established in-house protocol . Total RNA was used to prepare cDNA as described previously . Because the microarray targets were oligo(dT) primed, all cDNA synthesis reactions were oligo(dT) primed as well, and qPCR primer sets were designed so that amplicons were upstream of 60-mer oligonucleotide probes when possible, or less than 650 bp downstream. These steps were taken to minimize the effects of 3' end-labeling bias from microarray target synthesis. Yeast spike-in standard curve cDNA was prepared by mixing equal copy numbers of each synthetic yeast RNA with Mouse Universal Reference total RNA, followed by cDNA synthesis. A standard for copy-number measurement of endogenous mouse genes was prepared by transcribing cDNA clones and adding these transcripts in equal numbers to yeast total RNA, followed by cDNA synthesis. A BioMek 2000 liquid-handling system (Beckman) was used to aliquot cDNA into 96- and 384-well plates, then assemble and aliquot PCR master mix into 20-25 μl reactions. Plates were run on ABI 7700 or ABI 7900 HT Sequence Detection Systems using the default cycling program, and data was processed using SDS 1.9 or SDS 2.2 software (Applied Biosystems) and Microsoft Excel. Microarray images were processed with Agilent Feature Extractor A.7.5.1 software to generate normalized, background-subtracted feature intensities. Dye normalization was performed by applying a LOWESS algorithm to all significant, non-control and non-outlier features. Analysis of variance (ANOVA) and replicate averaging was performed as previously described  using NIA Array Analysis Tool software , which normalizes each probe according to reference RNA signals. where P oi is the observed fraction placental RNA content calculated from a given probe i, I pi and I100iare the normalized log10[intensity] values for the probe i at placental RNA percentages p and 100, respectively, and a i and b i are the intercept and slope of the ratios versus the input placental RNA fraction for probe i. For the population of observed fractions at each input placental RNA fraction, the mean and median were calculated, along with the 2.5, 25, 75, and 97.5 percentile boundaries (Figure 1). converts them to estimates of transcript copies per cell. Amounts of total RNA extracted per cell for the four tissue types (EM 3.0 pg/cell, PL 2.0 pg/cell, ES 2.3 pg/cell, TS 3.0 pg/cell) were estimated from cell counts, RNA yields, and in the case of E12.5 embryo and placenta, our estimate that the average cell volume in these tissues is approximately 1.5 × 10-9 cm3 per cell (data not shown). In the case of endogenous mouse transcript measurements, results from both the microarray and qPCR were normalized to Gapd expression. All microarray data will be deposited to the public repositories Gene Expression Omnibus at NCBI [30, 31] and ArrayExpress at EBI [32, 33] as soon as possible. The following additional data are available with the online version of this paper. Additional data file 1 is a table containing a standardized naming scheme for NIA oligonucleotide microarray platforms. Additional data file 2 is a table containing additional information on previous NIA microarray platforms and how they relate to that presented in this work. Additional data file 3 contains annotation of all probes in the NIA 44K Mouse Microarray v2.1. The authors thank Peter Webb at Agilent Technologies for his assistance in preparing the microarray design for production, and his colleague Paul Wolber for advice in constructing the yeast spike-in control constructs. Yong Qian of the NIA provided invaluable bioinformatics and computational support for many aspects of this work. We also thank Janet Rossant and Tilo Kunath for providing ES and TS cell RNA. DNA microarrays produced according to NIA designs are available commercially from Agilent Technologies. However, The National Institutes on Health and The National Institute on Aging do not endorse these products or make any claims or guarantees as to their quality or performance. This article is published under license to BioMed Central Ltd. This is an Open Access article distributed under the terms of the Creative Commons Attribution License (http://creativecommons.org/licenses/by/2.0), which permitsunrestricted use, distribution, and reproduction in any medium, provided the original work is properly cited.